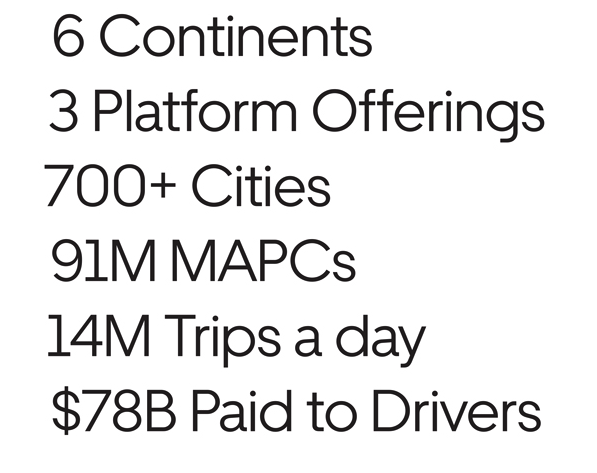 Uber released its long-awaited prospectus, giving us valuable insights. The company has the potential for massive growth, but there's a catch. No path to profit means I cannot recommend this as a Buy. Earlier this week, I wrote that the valuation for Uber Technologies (UBER) was too high at $120 billion and that the company should pursue something closer to $100 billion instead. That same day, the company announced they would be doing exactly that, and since then, Uber has also filed its long-awaited IPO prospectus. This filing gives us a fascinating look into the business and its various components and provides never-before-released full financial disclosures. For these reasons, I've revisited and updated my forecasts on the company, and frankly, the results look great, but there are too many assumptions to call it a buy without seeing some proof of action. Uber is a multinational company that almost everyone is familiar with, because of its disruptive impact on the taxi business. Unlike its competitor Lyft (LYFT), Uber is not just a pureplay on rideshare, offering investors a diversified business, including food delivery and freight. In fact, Uber Eats has been a disruptor in its respective space, "eating up" market share from competitors such as Postmates (POSTM), Seamless, and Grubhub (GRUB). Additionally, the company is international and operates on six continents both under the Uber brand and via strategically-purchased subsidiaries, such as Careem in the Middle East. Additionally, the company has been one of the most notable and successful unicorns coveted by Silicon Valley venture capital investors for the past decade, even attaining the rare status of "centa-unicorn" with its valuation now exceeding $100 billion. Uber has been able to grow to its massive valuation, despite not turning a profit, because of its impressive year-over-year revenue growth. The company has benefited both from its disruption of the taxi market and its low pricing strategy it employs in a bid to gain recurring riders and drivers, though at a loss. Historically, the company has seen revenue growth in the triple to double digits, and looking forward, there is no indication that will change. Despite strong revenue, you don't have to look far on the income statement to start seeing some weakness, as the gross margins are not particularly strong. The best of the most recent gross margins reported was 55% in Q1 of 2018. Operating margins are negative, and they're negative in the billion to upper hundred million dollar range. When looking forward, I would like to turn to the fundamental drivers that drive revenue and cost. Uber uses a metric called "Monthly Active Platform Consumers" or MAPCs, and it's a metric that's similar to MAUs or "Monthly Active Users" many communications and tech companies report. Though slowing, Uber has continued to add new MAPCs and is not demonstrating any notable seasonality that is immediately visible in the charts. Trips are the next metric that pushes the needle on sales. Each trip represents additional cash inflows to the company, in the form of gross bookings. 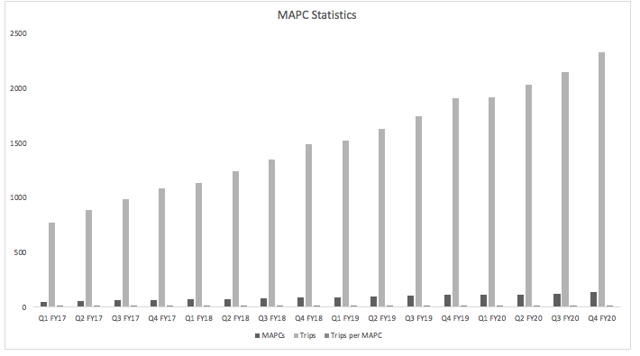 For this reason, the number of trips each quarter is significant, and determining how many each MAPCs takes on average is critical. Once again, Uber has proven they are capable of producing growth in the area, and once again, the trend is very linear. These figures lead us to gross bookings, which represent the gross sales the company makes, but they are not equal to revenue. Uber and Lyft operate as booking agents between businesses and clients. Drivers and participating restaurants act as businesses seeking clients, while the passengers and hungry eaters act as the clients, with Uber simply acting as the middleman. To incentivize the use of the Uber, the company pays a significant portion of their gross bookings to their drivers, and recently, their riders, in the form of rewards. When all is said and done, Uber is usually left with between 20% and 25% of their gross bookings in the form of revenue. The table above represents my projections in terms of MAPCs, trips, and the resulting trips per MAPC. Fortunately, for the company, it appears very likely that the trend of increases in MAPCs and trips will continue, with each MAPC using the service more frequently with the progression of time. The resulting gross bookings levels are shown in the chart above, and the underlying data driving this figure is detailed in the table below. Uber Eats is easily the biggest contributor to growth today and going forward, in my projections. I see this segment being outpaced by Other Bets. However, I do not see this growing to a size that this growth becomes significant in terms of contribution to the business, in the near future. Having made these projections, I am able to build out the statement of income for the next eight quarters. I have to note that these numbers are better than my previous projections based on the macro growth in the rideshare industry. This is a result of having access to the Uber Eats numbers as well as the rideshare platform results. One item of note is that I do not project profitability in the near future, and I expect the relatively disappointing margins to remain about the same. My valuation is based on the performance of Lyft. After its IPO, the company seemed to find a level of support around $68 per share, which was the high range that was originally provided by the underwriting syndicate. This has since collapsed following comments by the NYU professor Aswath Damodaran (also a Seeking Alpha Contributor) when he stated on CNBC that the company should be valued at $59, causing the stock to immediately drop to around said level. That being said, I think the initial support level from the market, as well as the valuation from the underwriters (who also do not want to overprice an offering), is more than case enough for the 9x revenue level given to the company. Given that Lyft is the most easily comparable entity, I will also apply this to Uber. I have to use the company's total valuation vs. a share price, because no price range has been provided, and using the arbitrary placeholder of one billion dollars will quickly become outdated and overcomplicate things. Right now, I see the company at fair value right around $ 100 billion, so while I would rather they leave a little on the table, I think the IPO will be priced fairly. That being said, I feel a little uneasy about the future valuation of $150 billion and almost $200 billion, because I am not sure the market will afford the company this lofty multiple without a better-defined path to profitability, but I will touch on this more in the risks. Uber and Lyft operate something of a duopoly. There are other, much smaller players, but these two control the market, and they've been long engulfed in a price, in a bid to gain dominance. In terms of growing their rider-base, both companies have outdone themselves. It is clear, from the chart above, that ridership is up, but what is equally clear is that each ride is declining in value, and to make matters worse, this figure is gross. This means that as that figure goes down, the revenue margin hurts more and more. Uber Eats has benefited the company in this regard, but also looking at the first graphic in my report, you can clearly see just how bad those margins are and how much is just going to the restaurants. For this reason, I could even see some of my revenue estimates proving a little too high, because of the added cost off of gross that comes in with the increases in Uber Eats usage. This is easily the biggest risk to the company and one that could undermine the valuation if it is not addressed by the company in their upcoming earnings releases. Uber is one of the most exciting IPOs to watch, and it could offer massive growth. That being said, I cannot, in good conscience, recommend you buy this stock unless there is a path to profits or some signs the price war is coming to an end. I'm giving this a Hold. Wait on a few earnings reports and lockup and get a better understanding of the risks and the market's acceptance of the company's shortcomings before making an investment.